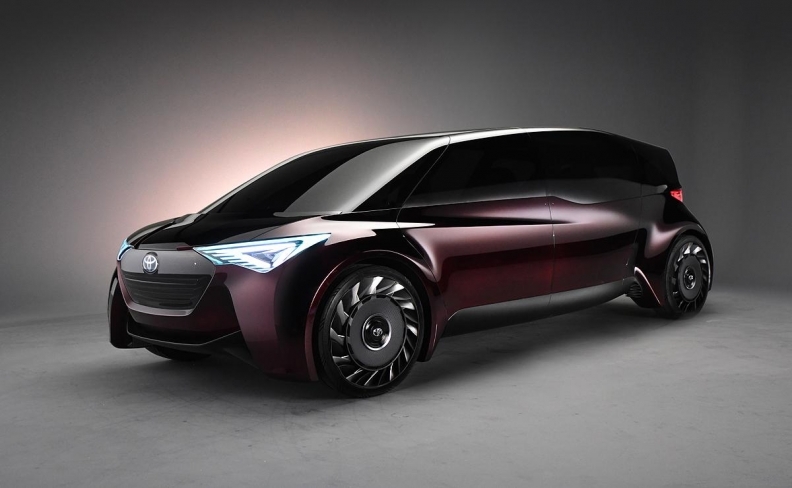 Toyota featured airless tires on its hydrogen-powered concept car, the Fine Comfort-Ride sedan. TOKYO -- Toyota Motor is exploring airless tires to help reduce the weight of battery-electric and fuel cell vehicles and boost performance, even though the technology is years away from being ready for commercial use. The automaker is using airless tires -- featuring individual motors in each wheel -- on a vehicle for the first time with its hydrogen-powered concept car, Fine-Comfort Ride, unveiled at the Tokyo auto show last week, chief engineer Takao Sato said in an interview. Since such tires comprise a band of rubber encircling a plastic-aluminum hub, the premise is that they could one day compensate for the weight of the motors, he said. Currently the concept tires weigh about the same as their pneumatic cousins, but Sato is counting on developments in the technology that can help shave 5 kilograms (11 pounds) -- or about 30 percent -- from each tire's weight by as early as 2025. Sumitomo Rubber Industries, which supplied the tires and has been testing them on local "kei" minicars and golf carts, said other Japanese carmakers are also interested, particularly for smaller EVs. "For automakers, the attraction of airless tires is for electrified vehicles," Sato said. While Toyota's Fine-Comfort Ride is the size of a crossover SUV, "these wheels could be used on any electrified vehicle," he said. Wako Iwamura, head of the five-year airless-tire project at Sumitomo Rubber, said his personal target is to have a commercial product ready by 2020. The Japanese tiremaker is actually a late entrant to the world of airless tires, following others including Bridgestone and Michelin & Cie. Michelin's Tweel -- a combination of tire and wheel -- is currently available for lawnmowers, golf carts, construction machinery, and recreational all-terrain vehicles. The technology is still unproven on passenger cars, and manufacturers will need to convince both automakers and the public that they are safe. A lighter tire is only one of Iwamura's goals. The other challenge to overcome is rolling resistance, or the friction that works against the tire when it's in motion. He estimates it's 10 percent to 20 percent worse than current pneumatic tires, a level unacceptable for vehicles that need to squeeze every kilometer of driving range from their lithium ion batteries. Cost, however, won't be a hurdle. Iwamura says his tires are already comparable in price to those filled with air.